Dog care becomes your primary responsibility when you own a dog. Owning a dog is a wonderful joy, providing love and companionship for you, but it also means taking care of the dog's health and every day needs. Your dog is 100% dependent on you. You need to provide love, food, shelter, veterinary care and exercise. All dogs should have fenced yards and dog houses if kept outside. Keep your dog in a fenced-in area or on a leash. No exceptions. If your dog is not in a fence, he should be on a leash. Even the best trained dog disobeys and gets distracted. It takes just seconds for a dog to get lost or worse. Remember though, dogs are pack animals and crave human attention and interaction. This means if you plan on keeping your dog outside, you should plan on spending a good amount of time outside with him; otherwise, dogs do best as inside companions. Make sure your dog has a properly fitting collar with an up-to-date ID tag. The ID tag should include your name, telephone number and address. Exercise your dog. Playing with your dog strengthens the dog-human bond and gives your dog a good workout, giving him a chance to release his natural energy. Be sure to provide the right amount of exercise for your dog's age and energy level. Provide a balanced diet with a nutritionally-balanced dog food. A basic rule of thumb: paying a dollar a pound usually yields a good solid food. Your veterinarian can also be able to give you good advice about what is the Best Dog Food for your dog. Have fresh water available at all times. Whether your dog lives inside or outside, good dog care includes ensuring fresh water is available 24 hours a day, seven days a week. If your dog drinks from a regular dog bowl, refresh his water at least once a day. In the winter, make sure the water has not frozen over. Dehydration can cause serious illness and death. Take your dog to the veterinarian. Adult dogs should have an annual check-up at the veterinarian. Puppies need to be seen more frequently. Vaccines, heartworm and flea and tick preventatives go a long way toward keeping your dog healthy and happy. Have your dog spayed and neutered. Spayed and neutered pets live longer lives, are less aggressive and roam less. Also, spaying/neutering your pet helps to control the pet overpopulation problem. Treat yourself and your dog to a training class. Training classes teach humans how to communicate with their dogs, so they can understand each other. A trained human-dog team strengthens the human bond and creates harmony in the household. Be patient, compassionate and kind. Like all relationships, human-dog relationships take work. If you give your dog the time, training, attention and love he needs, he will pay you back a thousand fold. 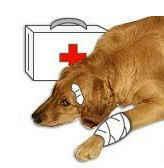 If you are having problems with your dog, seek advice from a veterinarian or trainer.